Can there be a more melancholy place in all East Anglia than Pakefield cliffs? I sat outside the Jolly Sailors public house, nursing my pint of Adnams and gazing out at them. A footpath runs along the top leading from the pub to the church, with benches set along it so you can gaze out to sea in that way we English like to do. But there is nothing attractive about the cliffs: they look more like a grassed-over landslip than anything that you'd expect to find at the coast, and the streets which lead down to them seem to have been hacked off at the limbs. In fact, that is precisely what has happened. All along this coast, for centuries, communities have suffered from the voracious appetite of the sea. But at the start of the 20th century, a new pier was built to the south of Lowestoft docks. It altered the movement of the tides to such an extent that, over the next 30 years, Pakefield lost more than 400 houses to the sea, along with many lives. 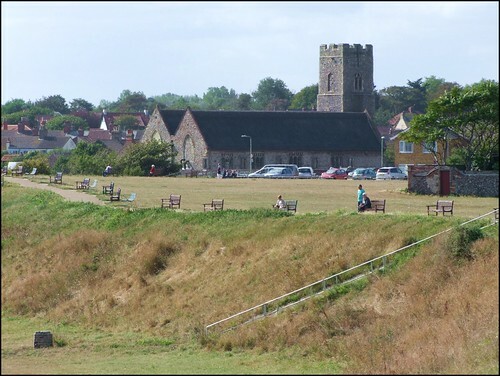 The churchyard of All Saints and St Margaret, which now stands precipitously above the beach, was then more than half a mile from the waves' reach. Look at it now; only time and a fragile sea wall separate this church from its watery destiny. I'm sorry to keep going on about it, but isn't Lowestoft a strange place! It straggles and billows relentlessly for four miles down the coast from far off Corton, until it finally peters out in this churchyard. It has some of the grandest and most fascinating architecture in Suffolk, along with some of the ugliest, bleakest and most derelict. The people are the friendliest in England, and are fiercely independent, supporting Norwich City rather than Ipswich Town, but treating their Norfolk cousins over the border in Great Yarmouth with a decided contempt. Lowestoft docks is the dismal, chaotic heart of this shapeless sprawl that is home to not far short of a hundred thousand people now. To the rest of Suffolk, Lowestoftians are like Kerrymen to the Irish or Belgians to the French; So like the rest of us; and yet, somehow... not quite. And of all Lowestoft, Pakefield is the strangest place. Mind you, All Saints and St Margaret has done pretty well to last as long as it has. Until the 1930s, Pakefield Parish Council clung stubbornly on to its independence, refusing to be incorporated into Lowestoft Borough despite the fait accompli that the sprawling suburb of Kirkley had presented it with. The provision of sea defences bankrupted the village, and still the sea took their houses. Eventually, they gave up in despair, and surrendered themselves to urban living. The financial muscle of the Borough became responsible for holding the line. If you had come here then, you would have seen a great rarity. This church had the only surviving intact Lenten veil pulley in all England, with wheels and everything; a 15th century device for drawing the Lenten curtain across the sanctuary, still servicable after half a Millenium. Having read about it in Munro Cautley's 1937 Suffolk Churches and their Treasures, I hastened up here to see it. But there was something I did not know about Pakefield. On a night in April 1941 Lowestoft suffered a serious bombing raid. All Saints and St Margaret sustained a direct hit, and was completely gutted. The pulley was destroyed. After the war, plans were drawn up by the Diocese of Norwich to abandon the church, and replace it with a modern church further inland. Sensible plans, perhaps, and I'm not sure why they were dropped. But instead, it was restored, and a completely new interior built within the shell of the old church. This is just as well for us, for there is something fascinating about All Saints and St Margaret that I have not mentioned. In fact, it is two churches, side by side, the parish churches of what, until the 18th century, were two separate parishes. The easternmost of these former parishes has now been completely taken by the sea. It may seem strange to us that these two naves, separated only by an open arcade, could have carried on their business like this. But it wasn't that unusual. Several other Suffolk churches were shared by two parishes; at Horringer for instance, where there was a chapel for the hamlet of Horsecroft, which served as their parish church. In other places, different parish churches shared the same churchyard. And in any case, any large medieval church would often have had several Masses going on at the same time; the fact that they might be for different parishes would have been irrelevant. In addition, the laity going about their devotions in the nave, offering up prayers, saying the rosary, and so on, would have provided a jolly cacophony in any church. The problems only arose with the triumph of Protestantism and the creation of the Church of England in the 16th century. With the shift to a congregational liturgy based on the ministry of the Word, with lengthy sermons from ministers who were preachers rather than priests, concurrent services could only be a disturbance. In fact, they became a downright nuisance.The parishes solved the problem by bricking up the arcade - not unreasonably, perhaps. When the two parishes were merged in 1743, this was opened up to provide a large church to serve the lot of them. So, suitably refreshed by Mr Adnam and his ales, I wheeled my bike along the clifftop path. But the fence that ran along the eastern side of the graveyard allowed no access to the church, and neither did the fence up the southern side. In fact, I had to go almost completely around the church before I could enter the graveyard from the little square which sits to the north of it. This gave me a chance to see the building from all sides of course. The thatching on the south nave is very attractive, and you can see the herring-bone brickwork which Mortlock thought might be a sign of the building's Saxon origins. You enter through the north porch into a building which has a pleasingly well-used feel to it, although inevitably very little of the atmosphere we have come to expect from entering a medieval building. For obvious reasons again there is very little Victorian glass, a refreshing change after the other medieval churches in the area, and some of what glass there is is very good, an intriguing 1961 window by Andrew Anderson in memory of Elizabeth Graham Hunt, who was the founder of the Pakefield Mothers Union. 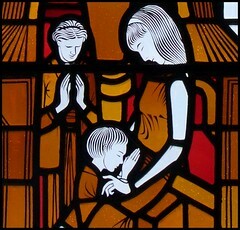 The use of brown in the glass is very unusual, and the relationship of grandmother, young mother and son is reminiscent of medieval and continental images of St Anne with the blessed Virgin and Christchild. The image of Christ as the Good Shepherd by HJ Salisbury in the glass of the south nave chancel is frankly hideous, though. The wooden-faced Christ holds the lamb as though it were a ventriloquist's dummy. It was installed to celebrate the protestant and evangelical ministry of a 19th Century Rector, presumably in reaction to the Anglo-catholic shenanigans up the road at Kirkley. There is also a scattering of fragments of surviving medieval and continental glass in some of the upper lights. Mounted on the wall is a set of brasses to John and Agnes Bowf, which is of interest because, dating from 1417, it is the earliest civilian brass in Suffolk. It is not in terribly good condition, but the fact that it survived at all is a testimony to the fact that it was mounted on the floor at the time of the German bombing. If there was a fire at Pakefield today it would run away like melting butter. But, as at nearby Kessingland, the greatest treasure here is the font. It is a late 14th century piece in unusually good condition, deeply cut and crocketted like the fonts you often find in Norfolk broadland parishes. It sits proudly beneath the arcade at the west end serving both naves, which are filled with modern chairs. All in all, I thought that this was a pleasing church, if not an exciting one. I headed off on my bike, looking back at the church as it sat nervously on the cliff-edge. Beyond it, the impatient waves churned, grating the shingle. If I come back in thirty years, what will I see then?